Keigo Morishita: Born on November 14, 1922 in Mie Prefecture. Embraced the faith at age 30. Completed the 141st session of Shuyoka in 1953 and immediately began his independent missionary work in Kobe. After three days and one thousand days, his efforts resulted in establishment of a church that he bequeathed to his mother-in-law. In 1958, he went to Los Angeles to do missionary work in the U.S. In 1960, he became the secretary of Mission Headquarters in America. In 1962 he established Brotherhood Fellowship. It became a church in the same year. He later went alone to New York to do missionary work. In 1971, he was appointed to the Board of Directors of Mission Headquarters in America. He served as minister of New York Center from 1997 to 2008. 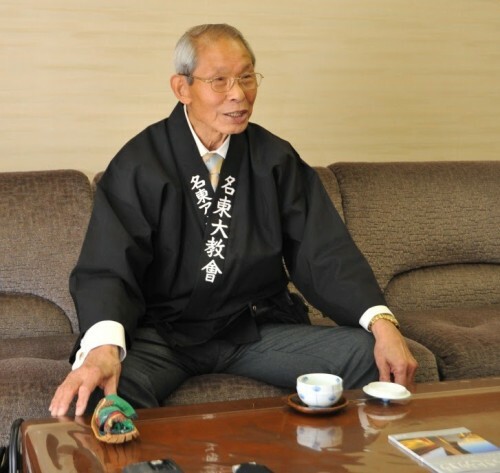 Keigo Morishita, seventh dan, was born in 1922, and at 86, is still an active Tenrikyo missionary. He went to the U.S. in 1958. He devoted 38 years in Los Angeles and 12 years in New York—a total of 50 years—to missionary activities. Ever since I read these words in a sports magazine last year, I wanted to have an opportunity to speak with Rev. Keigo Morishita. I was able to gain this opportunity the day before he was to go back to the United States and after he accomplished his goal of participating in his 30th Kodokan Judo Institute contest. As he strode into the interview room, he did not appear to be someone approaching 90. He tells us he was hesitant up until he participated in the recent contest. “I didn’t feel well this time. I could barely get up. Yet I managed to get through it since you don’t get the certificate until you participate 30 times. Although the point of Tenri judo is to win with an ippon, I didn’t want to be reckless so I ended up getting a tie.” He showed us his arms while saying this. They were covered with bruises. Rev. Morishita embraced the faith at age 30 after he was inspired by a talk in Jiba. 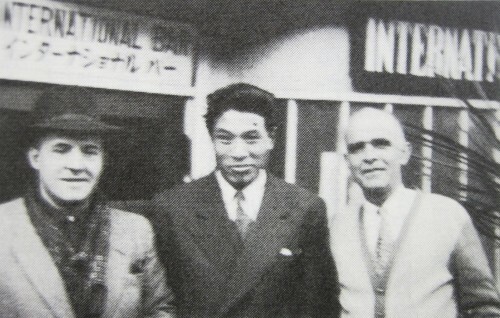 He went to the U.S. after doing missionary work in Kobe. He helped establish a church both in Japan and the U.S. He also established judo dojos at Tenrikyo Mission Headquarters in America and Tenrikyo Mission New York Center. His efforts to do missionary work in Los Angeles and New York were initiated by requests from his grand church minister. He took off as soon as he answered in the affirmative. His missionary efforts began without anything to depend on. He must have gone through countless knots during his long journey. Yet Rev. Morishita pursued the path and willingly accepted the voice of his parent. He spread the path with the help of judo. Judo also embodied the intentions of the second Shinbashira (Shozen Nakayama). Rev. Morishita truly appeared to us as a pioneer of the path who stands at the forefront of the overseas mission as he forcefully told us he still had many things to do. The day after our interview, Rev. Morishita came to visit us once again en route to the airport. He brought with him plenty of materials that he forgot to mention to us the previous day. The handshake with which he exchanged with us before he departed was full of warmth. Arakitoryo: Rev. Morishita, you are a first-generation follower. Could you talk about your life until you embraced the faith? Morishita: I am the last of five boys and four girls. My eldest brother was a net fisherman. My second eldest brother was a priest of the Soto sect. My other two brothers were military policemen. I wasn’t born a Morishita. When I was 10, I went from Mie to Shimane. I was adopted by an uncle on my mother’s side. In 1940, I graduated from Hamada Middle School (old-education-system). It was still in the middle of the war. Since two of my older brothers were military policemen, I wanted to join the army after graduating. I was thinking of enrolling in the naval academy or military academy. Yet I was diagnosed with first-stage lung tuberculosis so I couldn’t go to either academy. I ended up doing customs work in Kobe. Three years later, I finally ended up in the army, which I had longed for. I belonged to the field gun unit. A field gun is a cannon on wheels. We would pull these with horses up mountains and up hills and whatnot. Around the time, the the Battle of Imphal was going on and our unit was being sent there. But I contracted malaria and couldn’t go. I cried and begged for them to take me but it was no use. I was hospitalized in Shanghai and was sent home to Japan. I was really disappointed. I later recovered and reentered the army. When I looked up to find out what happened to my unit, I learned that the whole squad was decimated. They had gone during the rainy season. The horses couldn’t run in the muck because of all the rain so they had to dismantle the field guns and carried the guns themselves. Even with the guns dismantled, they were still damn heavy. They had to slog though the muck up mountain roads. They couldn’t use the horses so they ended up killing them. They were ordered to march on but there were no provisions or reinforcements. They were completely isolated. They were in no position to fight. At the war’s end, a lot of units ended up dying that way. If I had not caught malaria and remained in the army, I probably would have died with them. After the war, I returned to Kobe. But Kobe was in ruins. It was hard to find employment. I tried a variety of jobs but I felt that it wouldn’t amount to anything if I continued at the rate I was going. I thought to myself: I ought to start my own business and earn some dollars. Just then, the situation in the Korean Peninsula came to a tipping point. The U.S. forces would make a port call in Kobe along the way so I got the idea of creating a business geared to these sailors. I opened a bar for soldiers and sailors. The business was an enormous success.